I’m on the train home from Taunton where I’ve been at the End of Life Conference – “What is best in the South West: sharing our innovative practice across the region.” I was asked to be part of this inspiring day by Gina King, Quality Improvement End of Life Lead South West Region, to present our work on Anticipatory Prescribing Guidance (APG). This project was led by Cornwall Hospice Care and involved partnership working with local providers in Cornwall, including RCHT and Peninsula Community Health (now Cornwall Foundation Trust), and was funded by a successful bid for a Health Education South West grant. Collaboratively, we developed prescribing guidance for medicines to help control common symptoms patients may experience at the end of their lives. Through our education programme we trained nearly 1000 healthcare professionals in all care settings across Cornwall, including GPs, district nurses, acute and community hospital doctors, nurses and pharmacists and liaised with the South West Ambulance Service to incorporate this guidance into mandatory training for paramedics. As well as the symptom control guidance, we facilitated the healthcare professionals’ understanding of roles in delivering individualised care for patients who are dying and their families, including opening up discussions to find out, and act on, what matters most to patients. 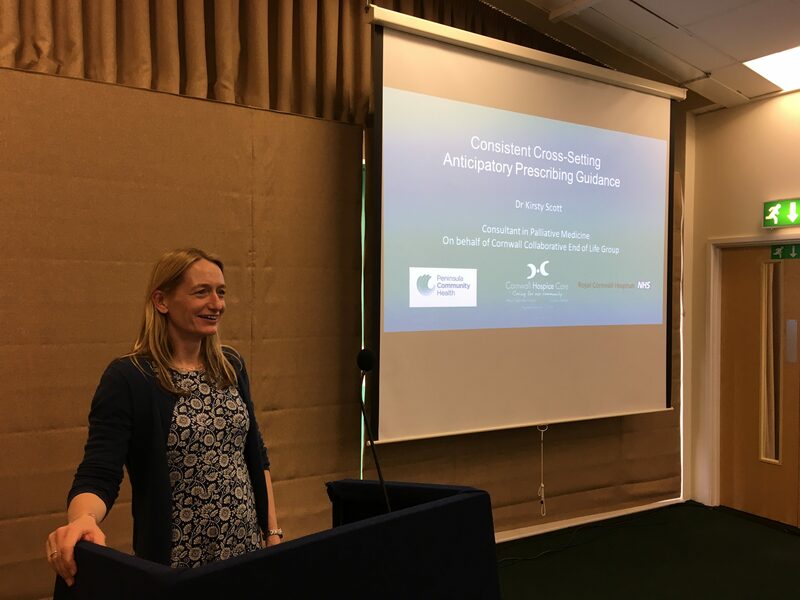 Our project saw a significant increase in the knowledge of the healthcare professionals after the training and of those who used the guidance, 90% felt it had improved patients’ symptom control at the end of life. Those professionals have also told us that they feel more confident in their symptom management and in discussing and delivering individualised care to patients, and highly value the 24/7 Cornwall Hospice Care telephone advice line, which is available to all healthcare professionals. Two years on from the end of our project, the APG is now firmly embedded in all healthcare settings across Cornwall. For this work we were delighted to be short-listed for the 2017 BMJ Palliative and Hospice Care award, but, most rewardingly of all, audits in Cornwall have shown a huge increase in the numbers of patients in the community, acute hospital and community hospitals who are now being prescribed the appropriate medicines to enable them to have good symptom control at the end of their lives. It was a privilege to share our project with 100 delegates from all over the South West today. I hope they have been inspired by our project, as I was, in turn, by other innovative work being carried out in the region.